Dri-Dek's anti-skid, self-draining surfaces keeps wet floors dry. It's perfect in showers, locker rooms, pool areas and saunas. Just snap the flexible 12-by-12-inch interlocking tiles together to form a custom surface of any length, width or shape. Also available in 3-by-4-foot interlocking Sheets and 3-by-12-foot interlocking Rolls. Comes in 12 designer colors. Ultra Pro 2000 Low VOC represents a unique proprietary paint formula developed in compliance with current VOC regulations for rubber-based products. 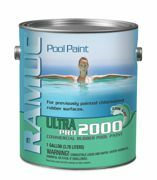 It is self-priming and can be applied to concrete and plaster, as well as over chlorinated or synthetic rubber pool paints. Ultra Pro 2000 provides up to two years of service life. Available in two color options, dawn blue and white, both with a flat finish. The paint is approved for use in all 50 states. The Motion Trek 350 is an ADA-compliant, battery-powered lift that is self-operable from the deck and water with a robust operating system. The Motion Trek 350 is designed for in-ground pools and spas. Accommodates pool wall setback of 6 inches to 22 inches and water draft up to 12 inches. Spacious seat with excellent lumbar support designed for ease of transfer. The new Mobile WaterLink® Spin Touch™ code 3581 water analyzer was voted Best New Product at the 2016 International Pool Spa Patio Expo in New Orleans. The photometer was designed to be used on-site by pool operators and service professionals. The precise WaterLink® Spin Touch™ with centrifugal fluidics photometry can measure 10 different tests in just 60 seconds. 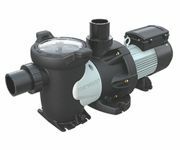 The new Hayward HCP 3000 Series pumps provide unmatched power and efficiency for almost any commercial pool. As the first pump with a 3-inch union to achieve a flow rate of more than 250 gpm at 60 feet of head, the HCP 3000 Series delivers class-leading performance and versatility. Their removable, oversized strainer basket and standard 3-inch unions make installation easy, and with a TEFC motor and chemical-resistant Vitron® seal, they win in durability as well. VIP Solutions LLC manufactures AquaTrek2 Pool Access Products. All systems are custom built using your pool's measurements to create an exceptional fit. Full 12-inch tread depth and low riser heights grant safe entry and exit. Customizable steps accommodate individual needs, including placement over existing pool steps. AquaTrek2 has an incomparable advantage to provide long-term placement in an aquatic environment. ADA and Standard systems including steps, ladders, ramps, transfer systems and aquatic wheelchairs. Vertical installation UV reduces installation space needed. Single-end UV lamp with top-loading quartz sleeve makes servicing easy. Low-pressure UV lamp offers up to 12,000 hours of continuous operation. Reduces chemical usage while improving air and water quality of pools. Provides instant protection against chlorine-resistant microorganisms such as Giardia and Cryptosporidium. Unit can be installed horizontally if required. Ask about BioShield® CLP Systems for even larger applications. 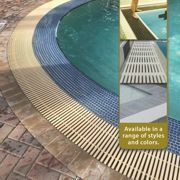 RenoSys® manufactures renovation products for the aquatic industry and offers a full range of DuraTech™ Pool Grating to accommodate any pool gutter width or style. T-Bar, I-Bar, Interlocking and PolyGrate™ styles are certified slip-resistant and are made in the USA from colorfast UV-resistant outdoor grade polymers. Fiberglass, PVC, Polymer, Granite and Stainless Steel options available. Ideal for repairing and renovating aquatic facilities. Many styles and colors in stock for immediate shipment.